Ok so I know it’s still September, but I am getting really excited for Halloween. And I can’t believe it’s over a month away! Unfortunately we don’t celebrate this holiday as much as we should in Australia, but that won’t stop me from getting overly festive. I recently discovered that Spotlight has gotten their Halloween range in store and I couldn’t contain my enthusiasm. 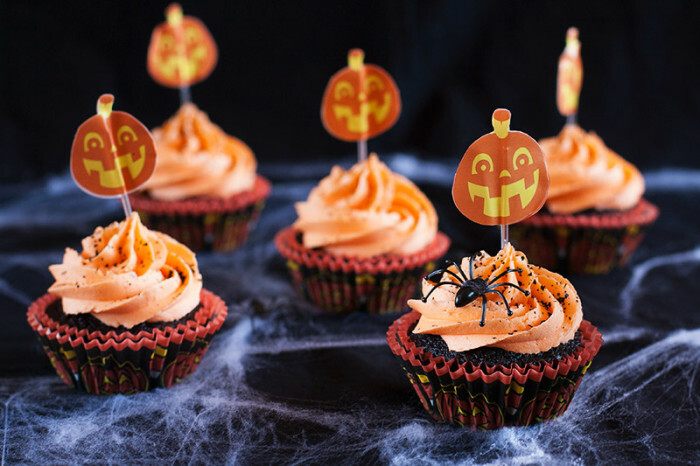 I needed to bake ALL the Halloween cupcakes! 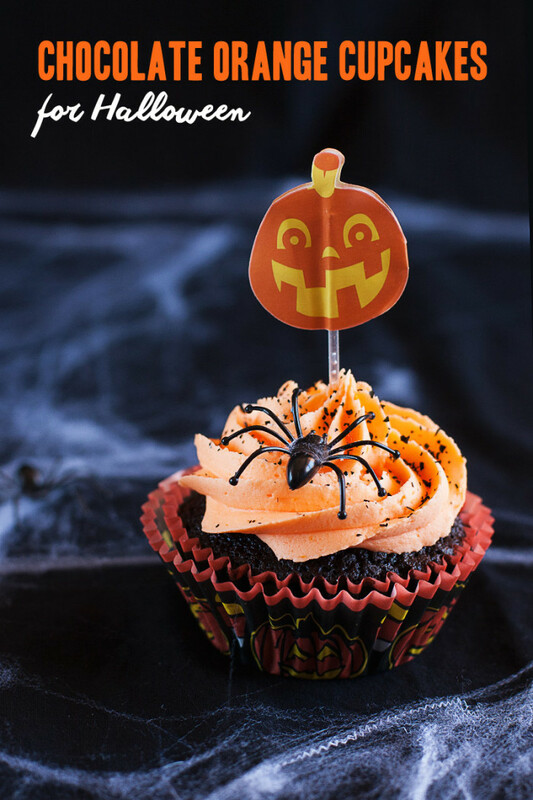 I set to work on creating the most suitably-themed Halloween cupcake I could make. Aren’t they cute and creepy? 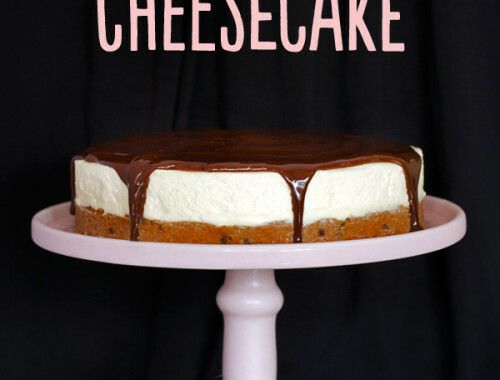 And most importantly, delicious! 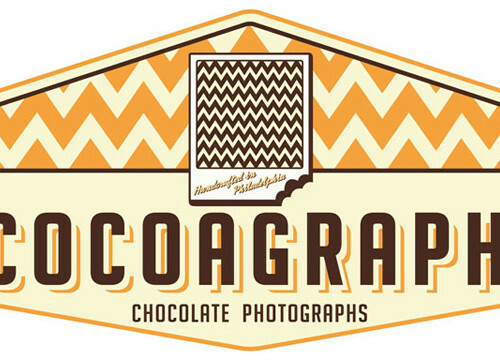 I started with my favourite chocolate cupcake recipe. This one is seriously foolproof, and it uses oil instead of butter in addition to coffee, to produce the lightest, most moist and rich cupcake I’ve ever tasted. 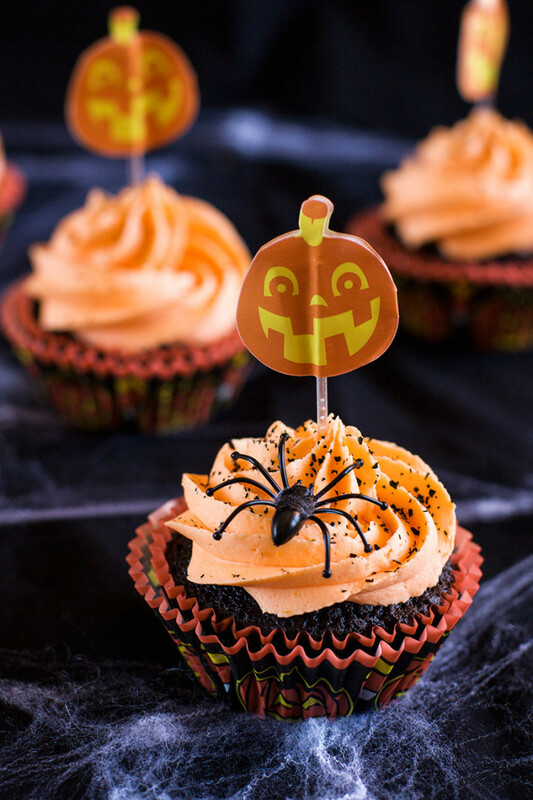 And since these cupcakes are for Halloween, orange was the natural pairing. Not just in colour, but in flavour too. I’ve used orange zest in both the cupcake and the buttercream, as well as freshly squeezed orange juice. Combine the milk, vinegar, coffee, oil and orange zest in another bowl. Beat in the eggs one at a time until well combined. Cream the butter in a bowl with an electric beater until very soft. Gradually add the icing sugar and beat into the butter, along with the orange zest and enough orange juice to soften the icing, to a spreadable consistency (you might not need all the icing sugar). Add in a few drops of orange food colouring and beat until combined. When the cupcakes are cool, spoon the mixture into an icing bag with a nozzle attached and ice the cupcakes. 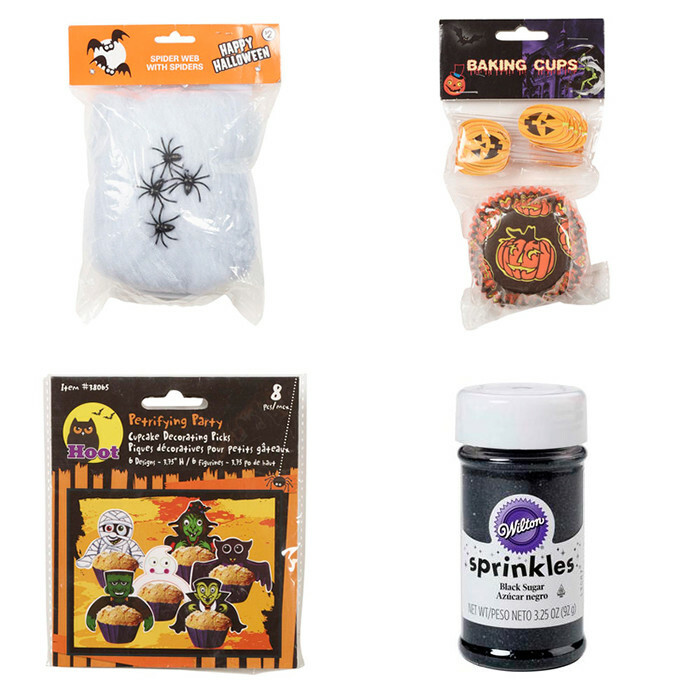 Add black sprinkles and your choice of Halloween cupcake toppers to complete the look! 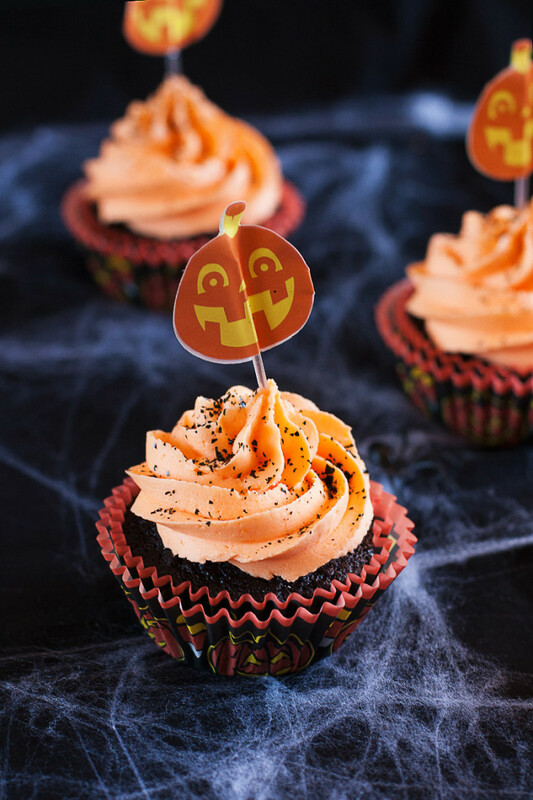 The fresh orange juice and zest makes this buttercream the perfect accompaniment to the rich and dark chocolate cupcake. 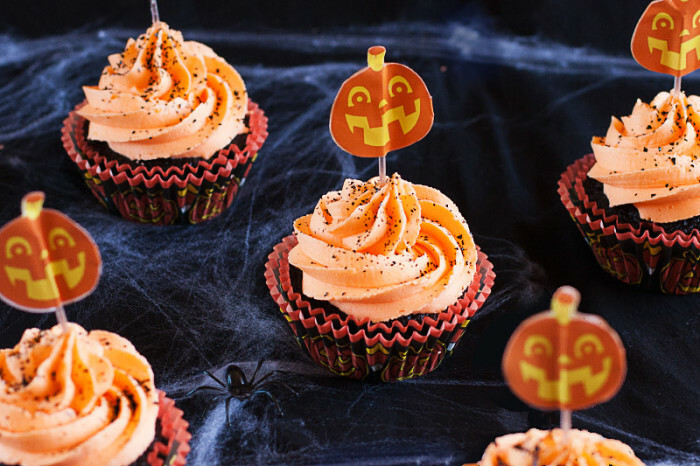 You could also add an orange filling to the cupcake to enhance the flavour even more. 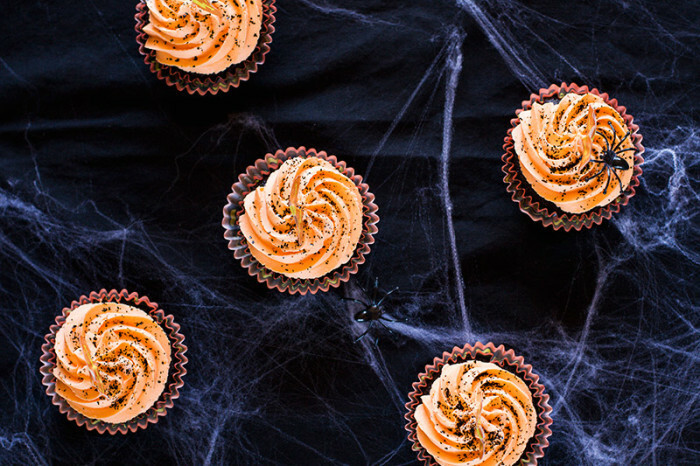 A final adornment of black sugar sprinkles makes this cupcake the perfect way to celebrate Halloween. And to be honest, this cupcake tastes so delicious I will be eating it all year round. 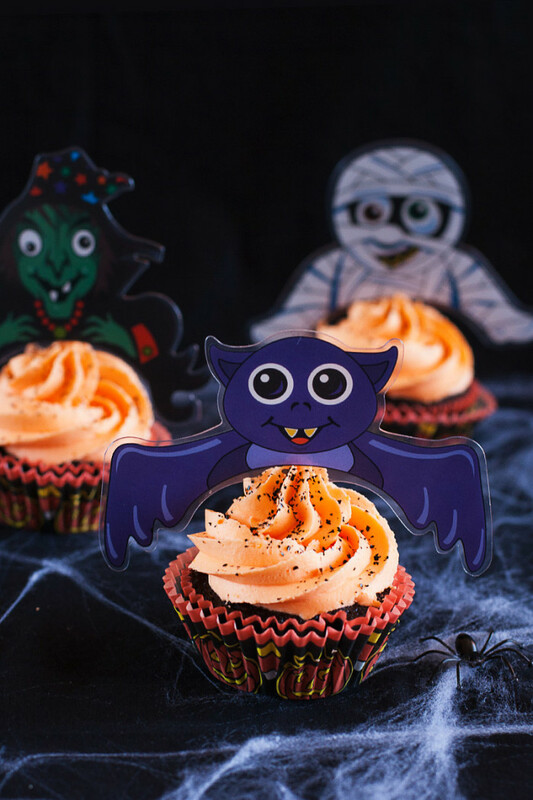 I also had some fun cartoon bats, zombies and witches to add to the cupcakes as an alternative. I’ll share with you the links below! To decorate my Halloween scene I of course needed fake spiderwebs and spiders. To decorate the cupcakes I picked up this cute cupcake set used in the first series of photos, and then these cupcake toppers in the final photo. And naturally I needed some black sugar sprinkles to finish off the look! All of these products are available at Spotlight right now, along with costumes and much more. I had to restrain myself not to pick up an outfit while I was there. 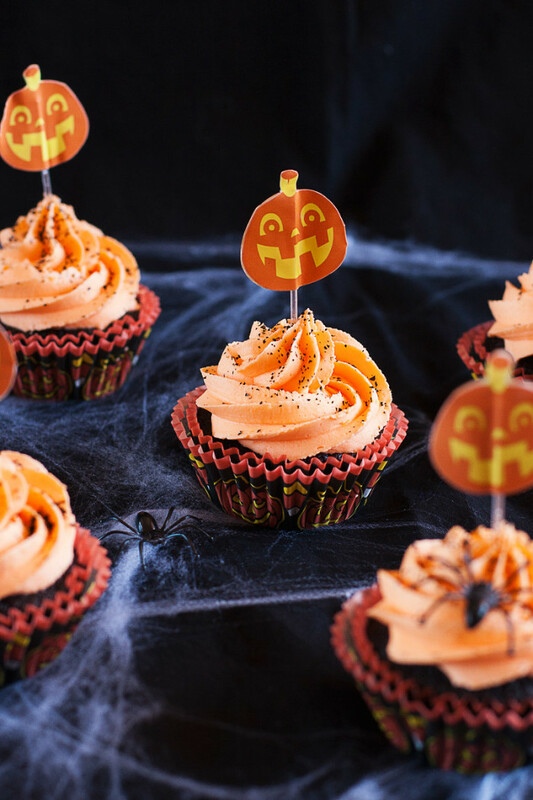 Oh and stay tuned for another Halloween recipe next month which involves some pretty awesomely gruesome bloody eyeball cupcakes – complete with strawberry “blood” and candy eyeballs! Are you excited for Halloween? What are you going to make? Will have to go to spotlight next week. I have to set aside a whole morning as I think that place eats time!!!!! Squid pasta is a GREAT idea for Halloween! Haha i love it! Oh gosh they are super cute. 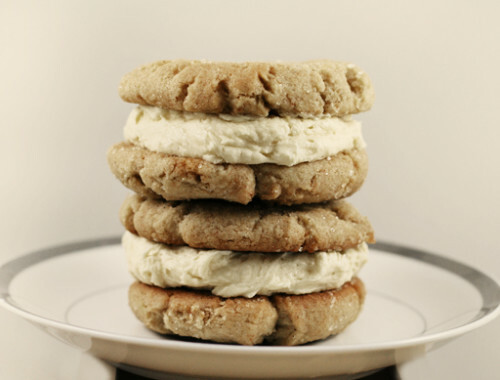 I so miss baking time – damned job. The icing sounds so delicious and I love that it is naturally coloured too.